Platelets are membrane-bound cell fragments derived from megakaryocytes, which are produced during thrombopoiesis. Megakaryocytes are produced from stem cells in the bone marrow by a process called thrombopoiesis. Megaryocytes create platelets by releasing protoplatelets that break up into numerous smaller, functional platelets. Thrombopoiesis is stimulated and regulated by the hormone thrombopoietin. Platelets have an average life span of five to ten days. Old platelets are destroyed by phagocytosis. The spleen holds a reservoir of additional platelets. Abnormal numbers of platelets result from problems in thrombopoiesis. This is associated with various disorders and potential pathological complications. megakaryocyte: A large cell found in bone marrow that is responsible for the production of platelets. Thrombopotein: A hormone produced by the liver or kidneys that stimulates megakaryocyte differentiation and platelet release. bone marrow: The fatty vascular tissue that fills the cavities of bones; the place where new blood cells are produced. Platelets are small, clear, irregularly-shaped cell fragments produced by larger precursor cells called megakaryocytes. Platelets are also called thrombocytes because they are involved in the blood clotting process, which is necessary for wound healing. Platelets are continuously produced as a component product of hematopoiesis (blood cell formation). Platelets are produced during hematopoiesis in a sub-process called thromopoiesis, or production of thrombocytes. Thrombopoiesis occurs from common myeloid progenitor cells in the bone marrow, which differentiate into promegakaryocytes and then into megakaryocytes. Megakaryocytes stay in the bone marrow and are thought to produce protoplatelets within their cytoplasm, which are released in cytoplasmic extensions upon cytokine stimulus. The protoplatelets then break up into hundreds of platelets that circulate throughout the bloodstream, while the remaining nucleus of the ruptured megakaryocyte is consumed by macrophages. Each megakaryocyte produces between 5,000 and 10,000 platelets before its cellular components are fully depleted. Altogether, around 10^11 platelets are produced each day in a healthy adult. The average lifespan of a platelet is just 5 to 10 days. Old platelets are destroyed by macrophage phagocytosis in the spleen and by Kupffer cells in the liver. Up to 40% of platelets are stored in the spleen as a reserve, released when needed by sympathetically-induced splenic muscle contractions during severe injury. 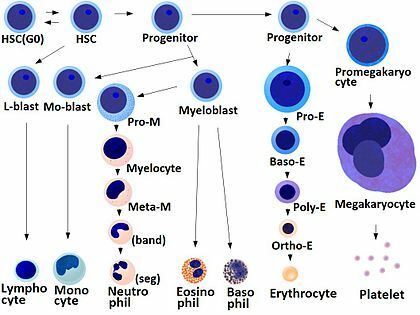 Hematopoiesis: Myeloid progenitor cells differentiate into promegakaryocytes, and megakaryocytes, which release platelets. Balanced thrombopoiesis is important because it directly influences the amount of platelets in the body and their associated complications. If the number of platelets is too low, excessive bleeding can occur, even from minor or superficial injuries. If the number of platelets is too high, blood clots can form (thrombosis) and travel through the bloodstream, which may obstruct blood vessels and result in ischemic events. These include stroke, myocardial infarction, pulmonary embolism, or infarction of other tissues. An abnormality or disease of the platelets is called a thrombocytopathy, which could be either a low number of platelets (thrombocytopenia), a decrease in function of platelets (thrombasthenia), or an increase in the number of platelets (thrombocytosis). In any case, issues with the number of circulating platelets is often due to issues in thrombopoietin feedback regulation, but may also be associated with genetic characteristics and certain medications and diseases. For example, thrombocytopenia often occurs in leukemia patents. Cancerous myeloid cells crowd out healthy ones in the bone marrow, causing impaired thrombopoiesis.